The ondori (rooster) is associated with the sun throughout Eurasia, and its call is said to drive away the evil spirits of darkness and herald the return of the favourable deities of light. 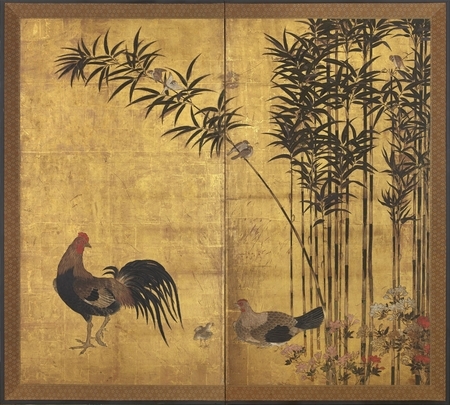 Veneration of the rooster in East Asia is widespread, but is particularly associated with Japan and China where the rooster is entrenched as one of the twelve animal symbols represented in the Chinese zodiac. The Kano school was the largest and most influential painting school in Japanese history and it dominated the centre of the Japanese art scene from the middle of the Muromachi period (15th century) to the end of Edo period (19th century). 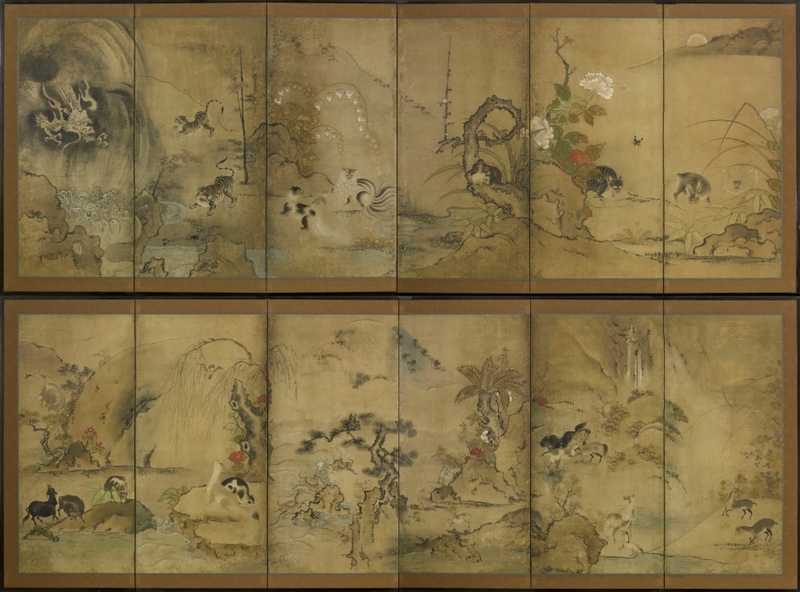 The school worked closely with the ruling classes and the elite of Japanese society receiving countless commissions to paint the walls, sliding doors and screens of the palaces, castles and temples as well as smaller paintings such as hanging scrolls and fans. The school was founded in the middle of the 15th century by Kano Masanobu (1434-1530) an artist who excelled in the fashionable Chinese-style Suiboku-ga (ink painting) of the Muromachi period (1392-1573). Having inherited the tradition of ink painting from his father, Kano Motonobu (1477?-1559) began to introduce the sentiment of the classical Japanese-style Tosa School, establishing a new painting style and the basis of a hereditary family tradition of painting which flourished for over 400 years. During the Edo Period (1603-1867) the Kano school was patronised by the Shogun and became the official painters working for the newly established leaders making it the most powerful painting school Japan has ever known. For a pair of wood sliding doors with a similar painting dated 1614 of roosters, chicks and a hen beside bamboo in the collection of Nagoya Castle, see The Kyoto National Museum ed., The 100th Anniversary of the Kyoto National Museum Special Exhibition: The Age of Gold, The Days of Dreams in praise of the paintings of the Momoyama Period, (Japan, 1997), p314-315, pl.74. SKU: 7667. Categories: Screens, Two Fold.